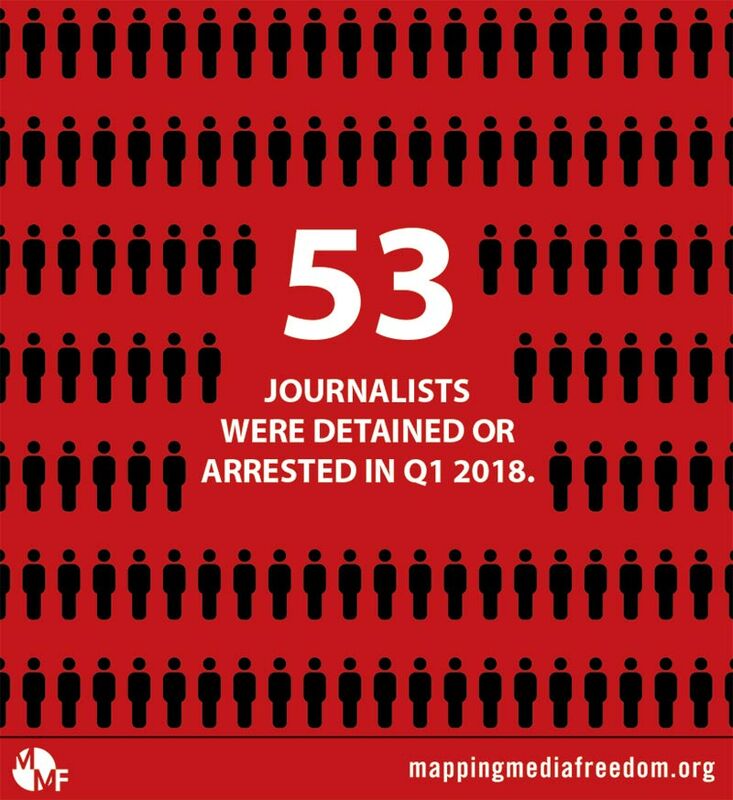 One journalist was killed during the first quarter of 2018; 52 reports of assault or injury were made; 53 reports of journalists being detained or arrested, with many reports involving the arrests of multiple journalists at one time; 54 reports included criminal charges and civil lawsuits; there were 59 reports of intimidation; 3 instances of sexual harassment were recorded; in 28 incidents media professionals had their property vandalised or confiscated; and there were 57 instances of journalists or sources being blocked. 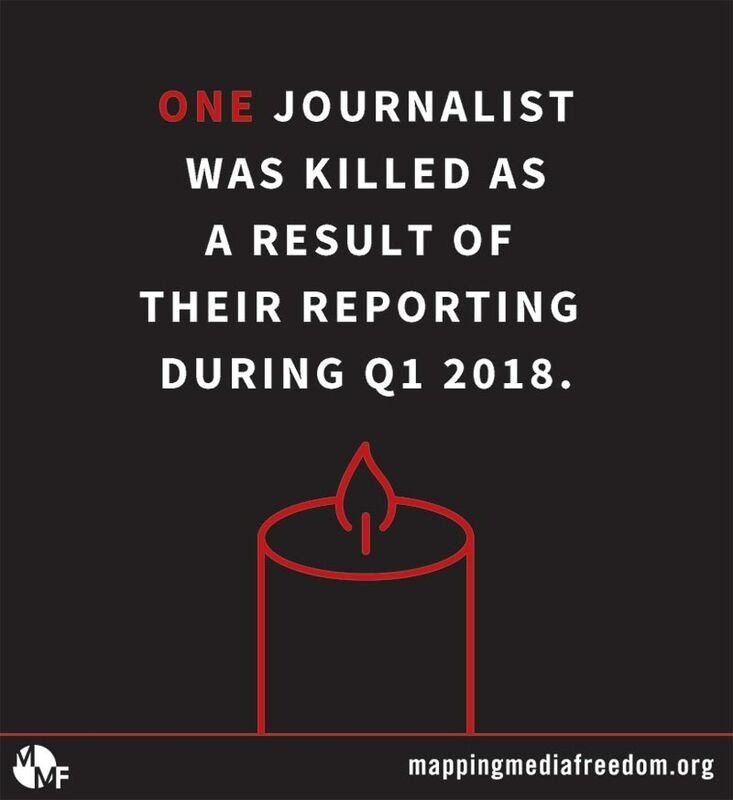 One media worker was killed as a result of their reporting in the first quarter of 2018. On 26 February Slovak investigative journalist Jan Kuciak was shot dead at his home in the village of Veľká Mača, 5km east of the capital Bratislava. Kuciak, who worked for Slovak news website Aktuality.sk, was shot in the chest and his fiancée was shot in the head. In September 2017 the journalist filed a complaint against businessman Marian Kočner for threatening him. Kočner was allegedly connected with the bankruptcy of Real Štúdio KFA. Kuciak had also revealed that Ladislav Bašternák was required to repay the Slovak treasury €2 million after a real estate transaction. Both businessmen are said to be associated with the ruling Smer party. Kuciak was also investigating, among other things, the Slovak oil company Petroltrans, which the journalist alleged was controlled by Ukrainian businessman Mykhailo Olevskyy through an offshore company. Petroltrans has won a major public contract, and has employed the daughter of Slovak financial services’ deputy head. Mapping Media Freedom documented 52 verified incidents of assault and injury in the first quarter of 2018, 30% of which occured in Ukraine (10) and Russia (6). On 23 January a TV crew for Revizzoro, a Pyatnitsa show that reviews cafes and restaurants, was assaulted while filming in cafe Neptun in Nizhny Novgorod. An employee of the cafe made death threats and punched one member of the crew in the face. On 23 March Olga Gunzhel, a journalist for the local newspaper Chronicles of Communities, was assaulted by employees of the Butenkivsky village council in the Poltava region. Council employees prevented Gunzhel from filming proceedings, which involved her husband Pavel Gunzhel, deputy head of the council. Speaking to the Institute of Mass Information, Pavel Gunzhel said: “An employee of the village council grabbed journalist’s hair, then another employee of the village council punched her in the face with his fists. He knocked the camera out of her hands, the battery fell out of the camera.” Olga Gunzhel suffered a fracture on her nose and a craniocerebral trauma. 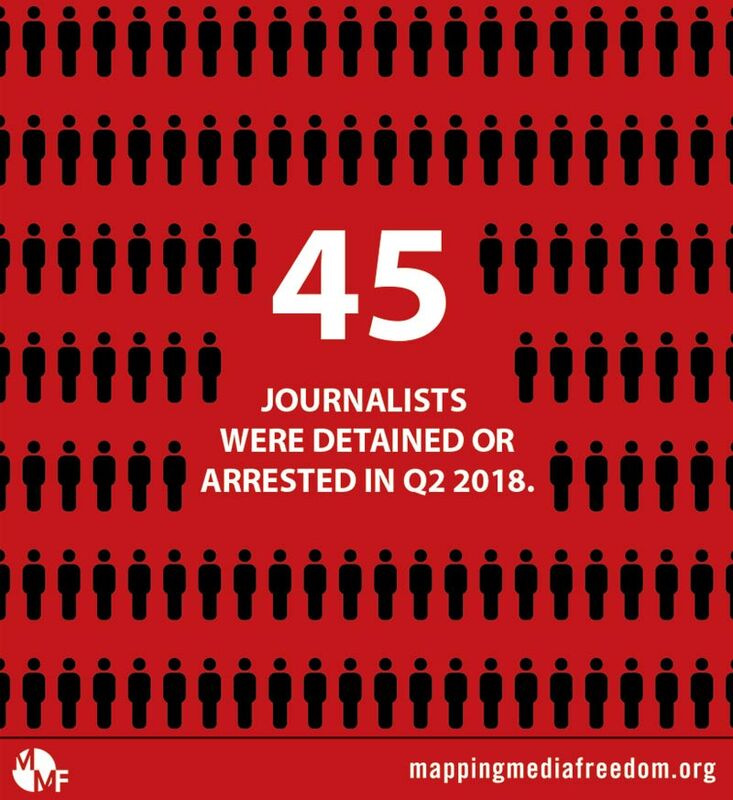 Of the 53 instances of arrest and detainment that occured in the first quarter of 2018, 37 took place in Turkey, involving at least 72 media workers. On 10 January Veli Büyükşahin, president of the executive board of the shuttered TV 10, along with broadcasting board member Veli Haydar Güleç were detained in early morning raids on their homes. TV10, a network representing Turkey’s Alevi minority community, was shut down under Turkey’s emergency decree. Büyükşahin and Güleç remain in pre-trial detention, along with 13 other people, on charges of “membership to a terrorist organisation”. In the early hours of 28 March the Istanbul office of the pro-Kurdish daily Özgürlükçü Demokrasi, and the printing house where the newspaper is printed, were raided, and the company’s assets frozen. Initially, the newspaper’s publisher İlhan Yaşar and eight print house workers, including owner Kasım Gün, were detained. In the weeks that followed, a total of six Özgürlükçü Demokrasi editors and 20 printing house workers would be arrested and placed in pre-trial detention. Out of the 54 instances of criminal charges or civil lawsuits that occured in the first quarter of 2018, 35 took place between Belarus (19) and Turkey (16). All but two of the Belarus reports involved a media worker being fined in the course of their duties. Fifteen journalists – 12 of which working for Belsat TV, a Poland-headquartered outlet aimed at Belarus, a total of 23 times. On 14 March Balrusian freelance journalists Kastus Zhukouski and Andrei Tolchyn were fined €255 each for the illegal production and distribution of media content for Belsat. It was the third time the pair had been fined in 2018. On 12 March Belarusian bloggers Alyaksandr Kabanau and Syarhei Pyatrukhin were fined 980 Belarusian rubles (€406) for the “illegal production and/or distribution of media content,” after hosting live broadcasts on Facebook and YouTube from the entrance checkpoint of Exide battery plant in Pinsk. The pair were tried under Article 22.9 of the Code of Administrative Offences, a law concerning media outlets. It was the first time social networks were deemed as such in Belarus. 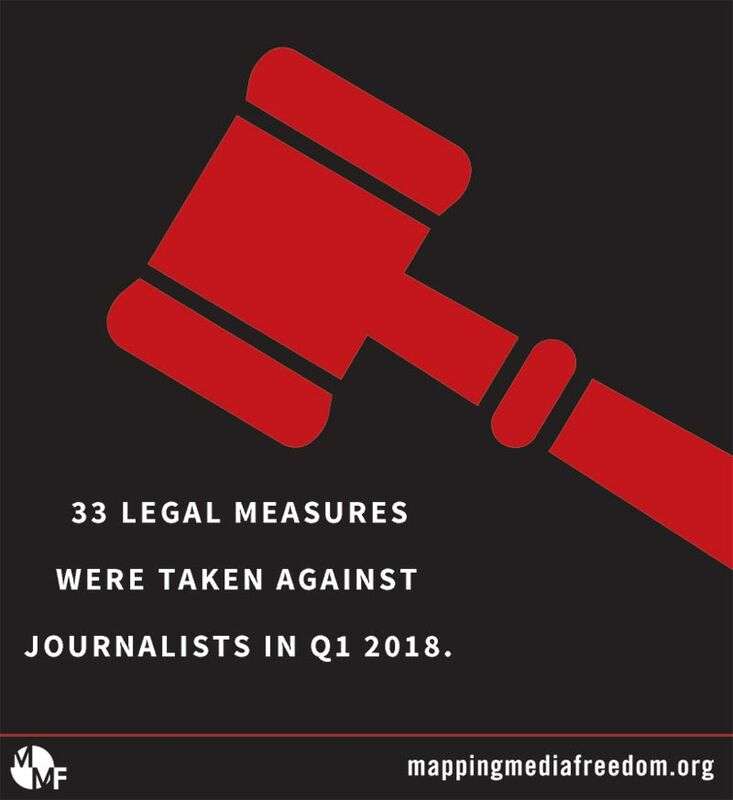 There were 33 legal measures taken against journalists in the first quarter of 2018. On 3 January French president Emmanuel Macron vowed to introduce a law to ban online fake news during French election campaigns, which was later rejected by the Senate. On 17 January Lithuanian MP Robertas Sarknickas proposed an amendment to the Law on Informing Public that would sanction media outlets and journalists for what he calls “widespread” “romanticising” of suicide. On 25 January members of Russia’s Stavropol Krai Duma (regional parliament) passed a law banning journalists from outlets recognised as “foreign agents” to enter Duma events. The bill imposes fines of up to 5 million rubles (€718,000) for outlets listed as “foreign agents” not observing the rules. On 6 February Polish President Andrzej Duda signed into law an amendment to the country’s Act on the Institute of National Remembrance that makes it a crime to “ascribe Nazi crimes to the Polish Nation or to the Polish State”. 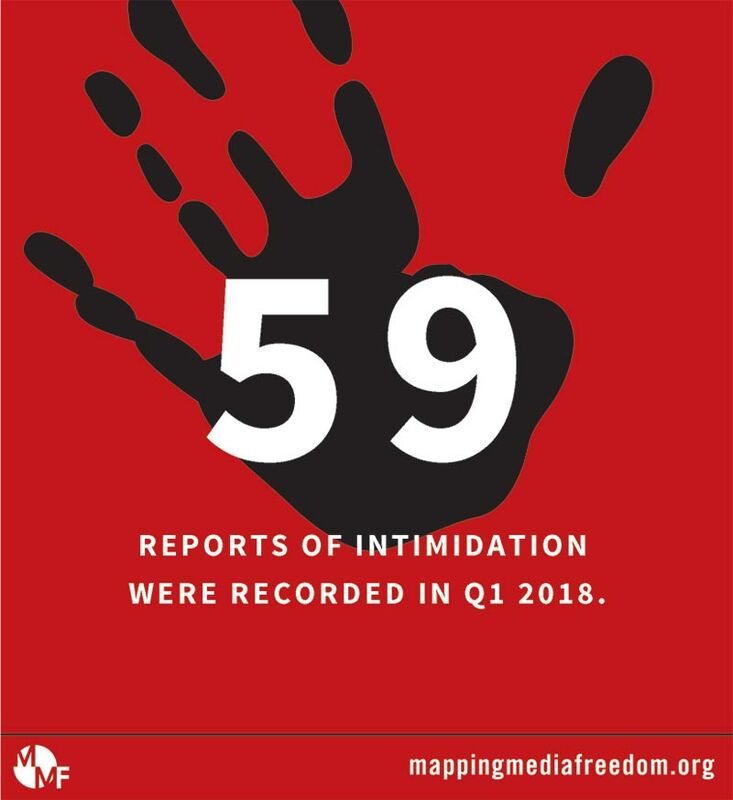 In all, 59 instances of intimidation were recorded across Europe by Mapping Media Freedom in the first quarter of 2018. On 28 March Hungarian politician János Lázár, then Secretary of State of Prime Minister’s Office, made comments about the future of Hír TV after one of its journalists, Zsolt Tárkányi, asked questions about the country’s defence budget. Lázár initially said the government would commit 2% of its GDP to military spending by 2022, but then changed the date to 2024. “We will ask you again in 2022,” Tárkányi said. Lázár then raised doubt as to whether Hír TV would “still be around then”. On 1 August Hír TV, which had been critical towards Orbán’s government since 2015, was taken over by figures close to the Hungarian government. Programmes which have been consistently critical of the government have been cancelled, and critical journalists such as Olga Kálmán, Balázs Bodacz and András Zimon were dismissed. Twenty-eight attacks to property were recorded across Europe by Mapping Media Freedom in the first quarter of 2018, including a spate of fires. On 1 February a car belonging to the girlfriend of Italian journalist Francesco Morbilio, a reporter at news outlet Il Quotidiano del Sud, was set on fire in the city of Vibo Valentia. On 8 February the car belonging to Zoran Milosheski, a correspondent for several national Macedonian media outlets and owner of the news website Publikum.mk, was set on fire. A year earlier, Milosheski’s garage was set on fire. On 22 February an known assailant set two plastic bottles containing gasoline alight inside the editorial office of the Ukrainian investigative news website Chetverta Vlada in the city of Rivne. Four people were inside the office at the time, including a child. Although no one was injured, one of the rooms was completely destroyed. Chetverta Vlada had been investigating illegal construction, land seizures and corruption. 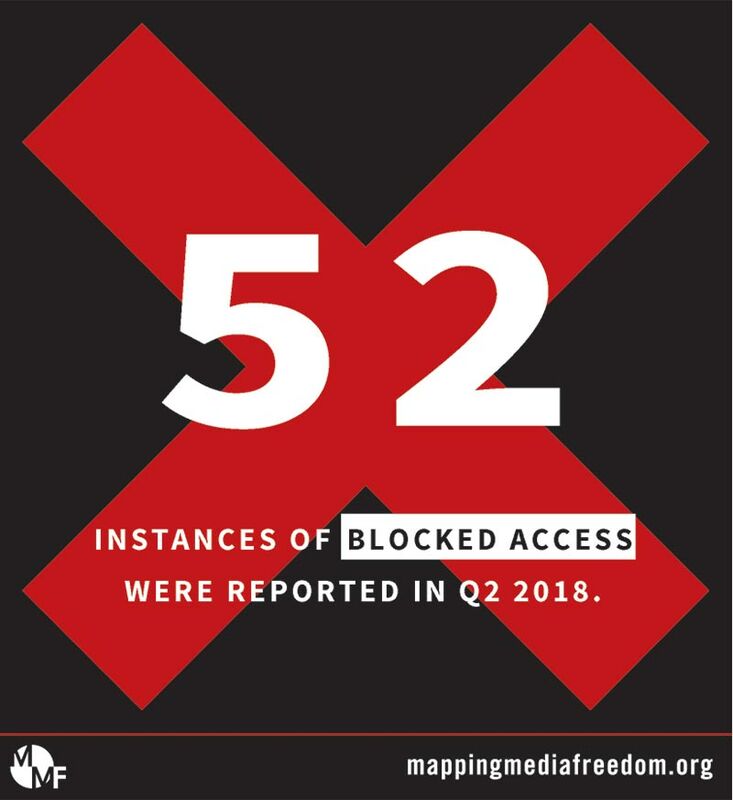 There were 57 confirmed cases of blocked access throughout Europe in the first quarter of 2018, in which journalists were expelled from a location or prevented from speaking to a source by way of obstruction. Many of these reports were connected to other violations, such as assault, damage to property and intimidation. Thirty of these violations took place in just four countries: Russia (10), Ukraine (9), Hungary (6) and Poland (5). On 3 February only journalists working for state-funded media outlets were allowed to attend a conference by the Constitutional Tribunal, Poland’s constitutional court, on the scientific achievements of Lech Morawski, an appointee to the tribunal who died in July 2017. Journalists working for private outlets were barred from attending. Dominika Długosz, a journalist for Polsat News, said independent journalists were not granted access because politicians in attendance were afraid of answering questions. In all, 49 media freedom violations were reported to Mapping Media Freedom in the first quarter of 2018, the largest of any country. This included 12 media workers who were sentenced to a total of 29 years in prison, while three were given combined suspended sentences of a total of 10 years, three months and two days. On 9 March two newspaper employees — Murat Karakaş and Leyla Yıldız — were sentenced to three years, one month and 15 days each for “aiding and abetting a terrorist organisation” by distributing the magazine Özgür Toplum. On 26 February Muhammet Doğru, a reporter for the shuttered Dicle news agency, was given a suspended prison sentence of eight years at the final hearing of a case in which he was tried alongside 12 other co-defendants at the Second High Criminal Court of Sakarya. Doğru was sentenced to six years and three months in prison for “membership in a terrorist organisation”. He was also sentenced to an additional two years and three months for “spreading propaganda for a terrorist organisation”. 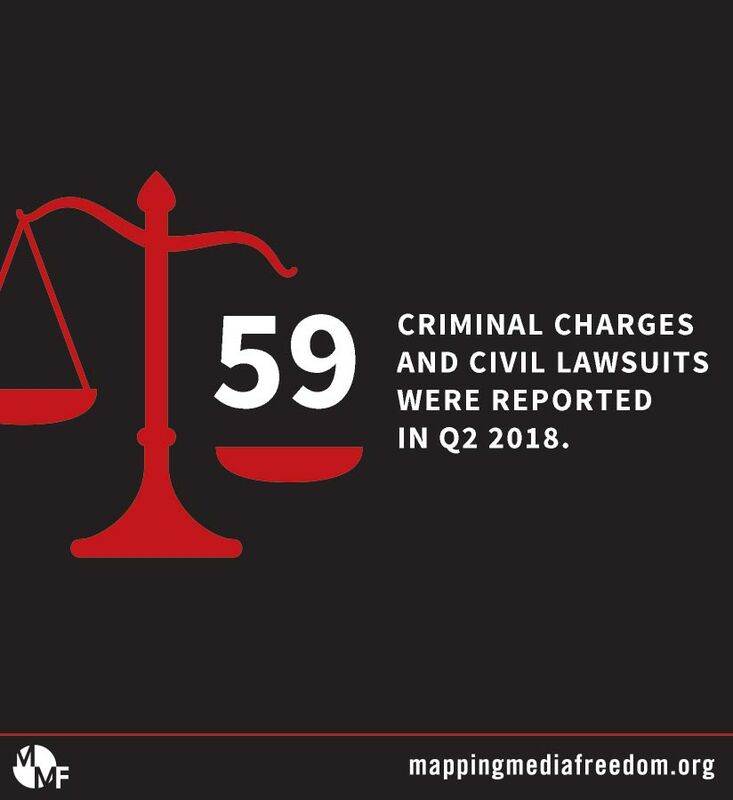 One journalist was killed during the second quarter of 2018; 64 reports of assault or injury were made; 45 reports of journalists being detained or arrested, with many reports involving the arrests of multiple journalists at one time; 59 reports included criminal charges and civil lawsuits; there were 92 reports of intimidation; 6 instances of sexual harassment were recorded; in 33 incidents media professionals had their property vandalised or confiscated; and there were 52 instances of journalists or sources being blocked. 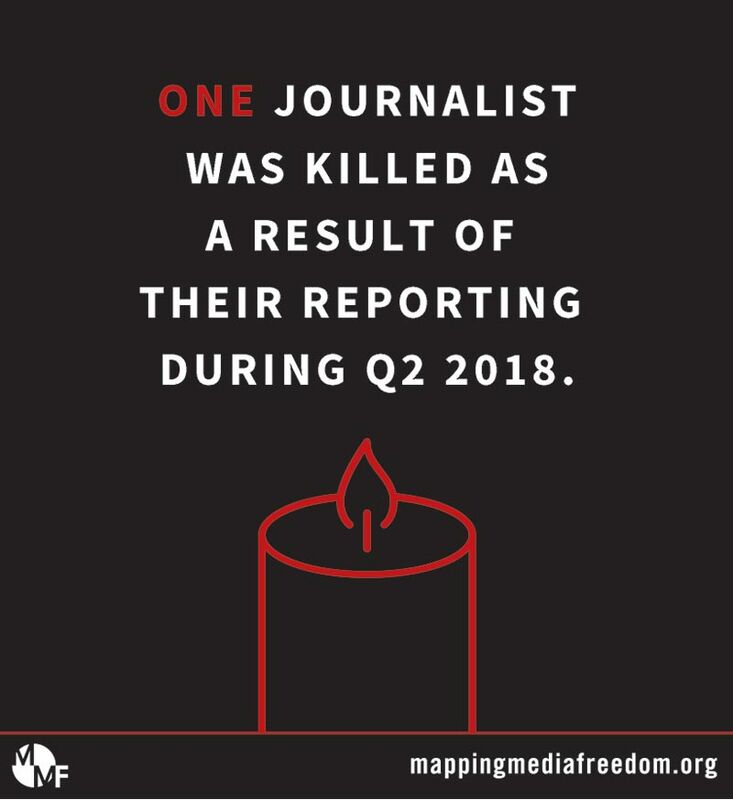 One journalist was killed as a result of their reporting in the second quarter of 2018. On 12 April investigative journalist Maksim Borodin, who worked for news service Novy Den, died after falling from the window of his fifth-floor apartment in Yekaterinburg, Russia. Polina Rumyantseva, editor-in-chief of Novy Den, said she did not believe Borodin committed suicide. A friend of Borodin’s, Vyacheslav Bashkov, wrote on Facebook on 15 April that Borodin contacted him at 5am on 11 April and claimed that several camouflaged, masked men were outside his apartment and a man with a gun was on his balcony. He said that Borodin was alarmed, but not hysterical or drunk. Borodin reportedly said that he believed his apartment was about to be searched and that the security officers were waiting for a court order. He asked Bashkov to find him a lawyer. An hour later, however, Borodin called back and said he had been mistaken and that the security officers were conducting some sort of drill. Borodin regularly wrote on crime and corruption. In the weeks before his death he wrote extensively about the deaths of Russian mercenaries fighting in Syria, identifying several fighters from the Urals city of Asbest who had been killed. On 12 October 2017 Borodin was assaulted by unidentified men with a metal pipe after giving an interview to independent TV station Dozhd about Alexey Uchitel’s movie Matilda. 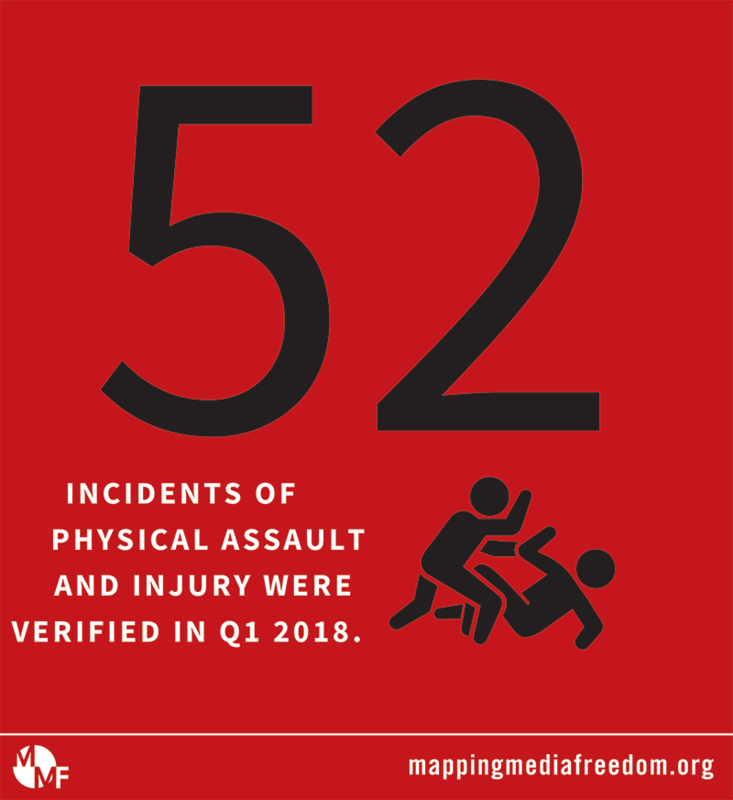 Mapping Media Freedom documented 64 verified incidents of assault and injury, across 17 countries, in the second quarter of 2018, a 23% increase on the first quarter. The countries with the most incidents were Russia (10), France (7) and Italy (6). All French incidents took place at protests or demonstrations. A photojournalist was knocked out and left bleeding from the head when riot police attacked him with batons at protest against railway reforms in Paris on 3 April, and on 19 April police fired a stun grenade at journalist Karine Pierre while she was covering an anti-government protest in the city. She suffered a broken collarbone. Four violations involved tear gas being fired at journalists. Freelance journalist Stéphanie Roy suffered second-degree burns and a broken thumb when police fired a tear gas canister at her on 14 April. Roy was covering a protest against french president Emmanuel Macron and in support of the Notre-Dame-des-Landes commune in Nantes. 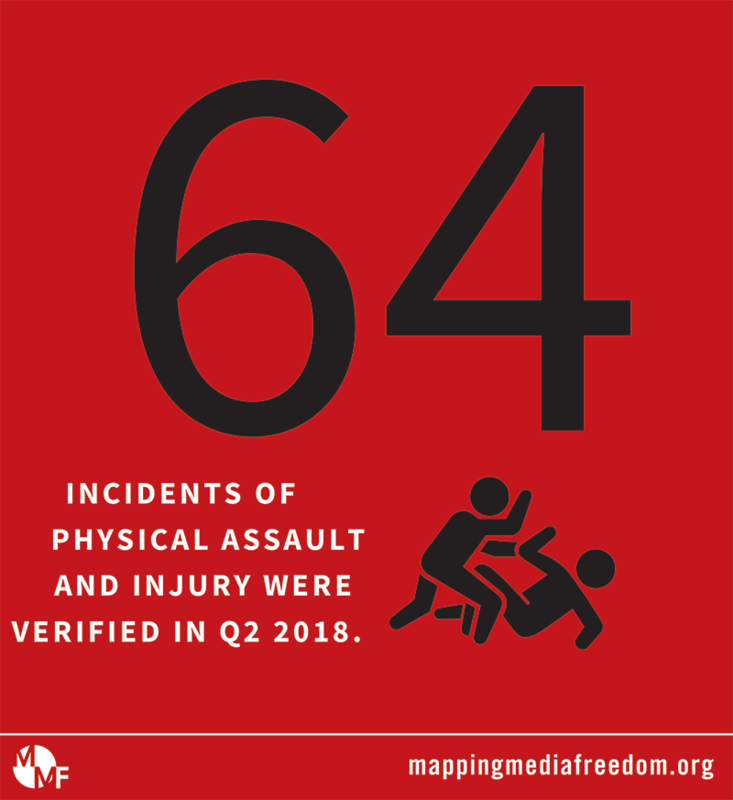 Mapping Media Freedom documented 45 verified incidents of assault and injury in the second quarter of 2018, a 15% decrease on the first quarter. The largest proportion of these incidents took place in Turkey (21), followed by Russia (4) and Ukraine (4). On 3 April Nevriye Kurt, a writer for the leftist magazine Red, was taken into custody during an early morning police raid on her home in Ankara over posts she made on social media. Kurt was released on 4 April but police confiscated her phone. July 2016 failed attempt at a coup. Her arrest came shortly after she shot a documentary on the coup attempt. On 20 June she was referred to the Criminal Judgeship of Peace on Duty of the Istanbul Courthouse and placed in pre-trial detention. The prosecutor said she “knowingly and willingly aided the terrorist organisation without being a part of its hierarchical structure”. Of the 59 instances of criminal charges and civil lawsuits reported to Mapping Media Freedom in the second quarter of 2018, 42 took place in Turkey (24) and Belarus (18). On 28 May the Kalinkavichy district court in the Homel region of Belarus fined freelance journalist Larysa Shchyrakova 980 rubles (around €490) for a live broadcast from an apartment in the town of Kalinkavichy where several representatives of the Mothers-328 Movement were holding a hunger strike. The fine was for the illegal production and distribution of media products under Article 22.9 of the country’s Code of Administrative Offences. On 6 June the Turkish Health Ministry filed a criminal suit for libel against Fatih Portakal, a popular anchor of Fox TV’s main evening news programme, for insulting and “denigrating state organs”. The ministry filed its complaint in response to a series of reports aired by Fox TV about a hospital in the southern Turkish city of Mersin. 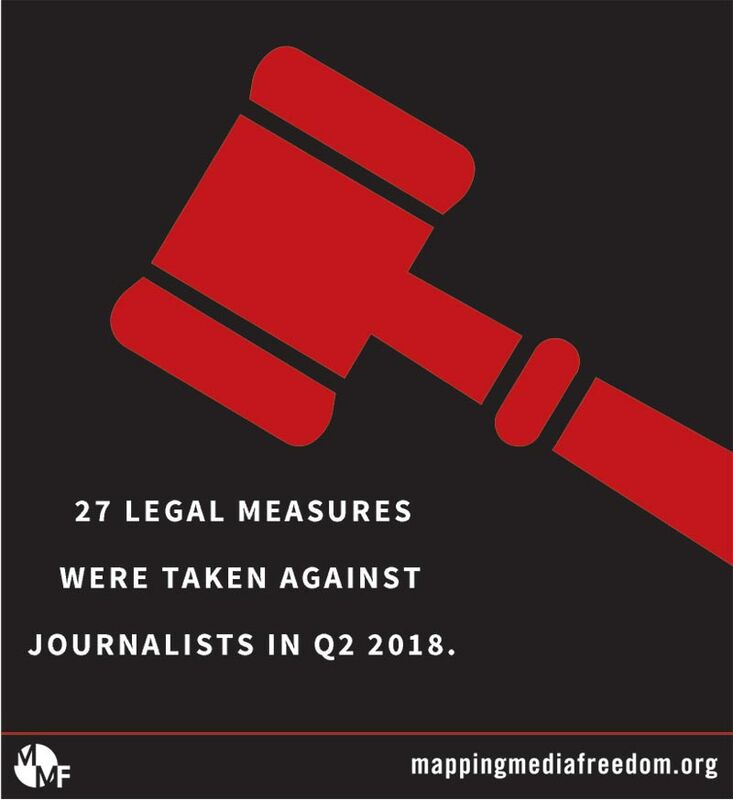 There were 27 legal measures taken against journalists in the second quarter of 2018, a 19% drop on the first quarter. On 13 May Liviu Dragnea, the president of the Romania’s ruling Social Democrat Party, called for an investigation into journalist Dan Tapalaga for an article on G4media.ro disclosing secret information about the Romanian government’s decision to adopt a resolution moving the country’s embassy from Tel Aviv to Jerusalem. The article, which appeared on 18 April, was actually the work of journalist Cristian Pantazi. In Spain pro-Independence parties in the Catalan regional parliament, on 25 May, rejected a proposal to create a commission on alleged espionage of journalists and politicians. The proposal was launched by centrist party Ciudadanos, right-wing People’s Party and leftist regional party Catalunya en Comú, and it was rejected by the pro-independence majority in parliament, made up by Junts per Catalunya, Esquerra Republicana de Catalunya and Candidatura de Unidad Popular. Cases of intimidation rose by 56% between quarter one and quarter two. 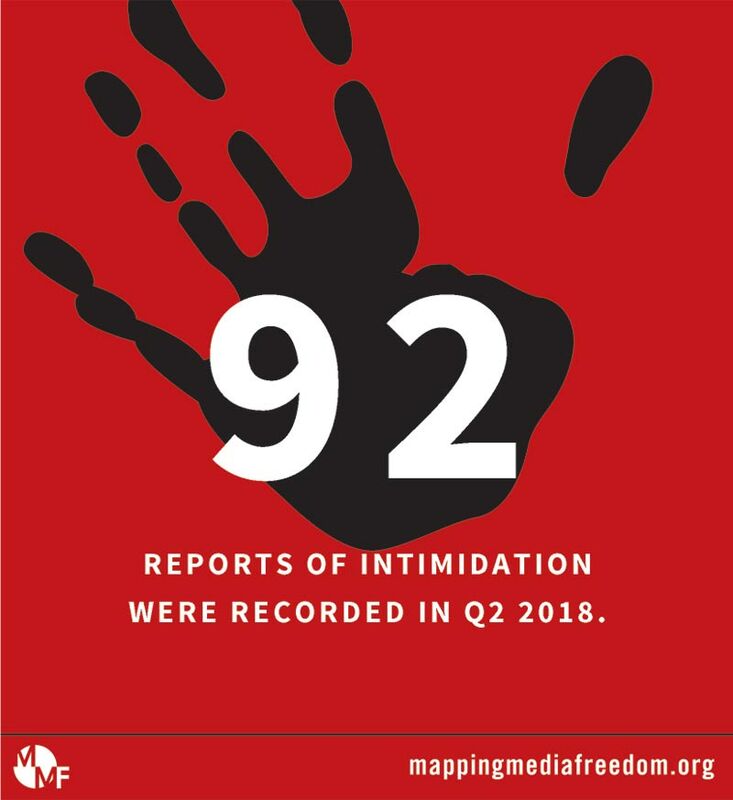 In all, 92 instances of intimidation across 28 countries were recorded across Europe by Mapping Media Freedom in the second quarter of 2018. The counties with the most amount of reports were Italy (14), Russia (8), Romania (7) and Ukraine (7). In Hungary, 6 instances of intimidation were recorded, including on 8 April when two journalists, Dávid Katz and Attila Kálmán, working for the news website hir24.hu, were threatened by Ádám Fásy, a well-known singer after the two tried to interview him after one of his shows during the Hungarian election campaign. Fásy was performing at the campaign event of a candidate for the ruling Fidesz party. The singer grabbed the camera, hit one of the journalists in the stomach and threatened the other with violence. Fásy then gave the camera to his daughter, who unsuccessfully tried to delete the footage. In Serbia, 6 instances of intimidation were recorded, including on 9 May when Tatjana Vojtehovsk, a journalist and TV host, received death threats on Twitter following an episode of Popular TV on Serbian women who survived time in a camp in Bosnia during the Bosnian War. The Twitter user wrote: “I’ll kill you, you treacherous whore.” They also threatened to “cut that two-faced treacherous pig head of yours”. 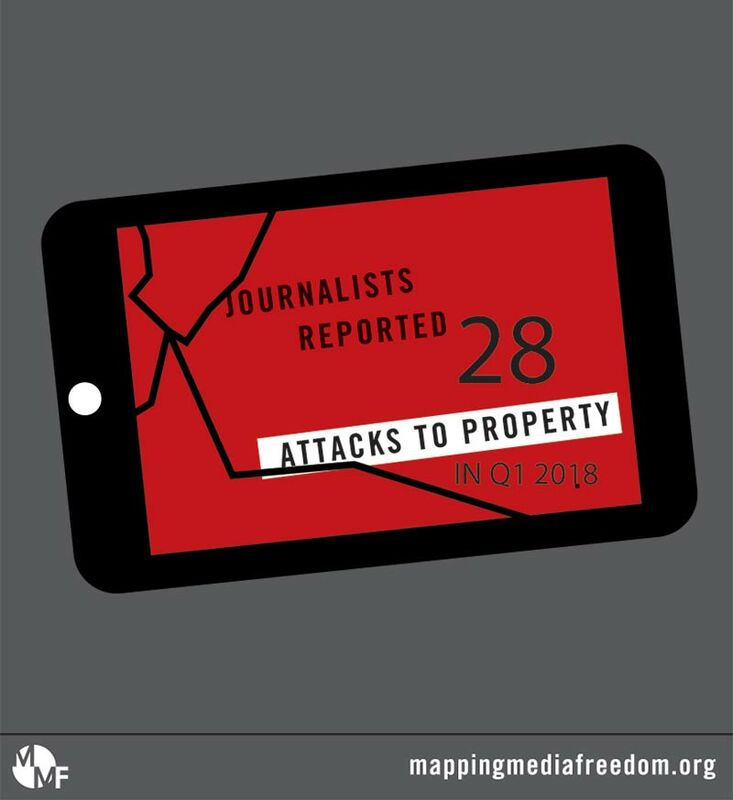 Thirty-three attacks to property were recorded across Europe by Mapping Media Freedom in the second quarter of 2018. At around 11am on 1 April an explosive device was thrown at the home of journalist Sead Sadiković in Bijelo Polje, Montenegro. Only the journalist’s wife was home at the time. Damage was caused to the house and nearby vehicles. Two suspects were identified and detained for 30 days. Sadiković had interviewed a relative of one of the suspects, which was considered insulting. On 15 May Slovakia’s National Crime Agency seized a mobile phone belonging to investigative reporter Pavla Holcova who works for the Czech Center for Investigative Reporting. Holcova was invited for what she believed to be a routine interview to aid the investigation into the murder of journalist Jan Kuciak in January 2018. Instead, she was interrogated for eight hours with irrelevant questions, threatened with a fine of €1,650 and criticised for her journalistic work “against the system”. A digital forensics unit attempted to download all of the information from the journalist’s phone and when this did not work, they pressured Holcova into handing over the device. There were 52 confirmed cases of blocked access throughout Europe in the second quarter of 2018, a slight decrease on the first quarter. Blocked access is when journalists are expelled from a location or prevented from speaking to a source by way of obstruction. On 26 April the chancellery of the Poland’s Sejm stopped issuing temporary passes to parliament allegedly for security and organisational reasons. While this was temporary, journalists without permanent passes were left without access to parliament. A privately-owned news channel like TVN24 was left with only two teams in the parliament building, while the state-owned TVP INFO had over a dozen. In Malta on 16 June a police officer tried to obstruct Darrin Zammit Lupi, a photographer working for Reuters, from covering a protest denouncing alleged government corruption outside the office of Maltese prime minister Joseph Muscat. Zammit Lupi had informed a police officer, Joseph Mangion, that he was a journalist. Mangion attempted to cover his camera lens with his hand and began taking pictures of Zammit Lupi on his phone. Four other police officers arrived in a car and asked to see the photographer’s ID, which he declined to show, saying his press card was enough. For the second quarter running, Turkey (37) was the country with most media freedom violations reported to Mapping Media Freedom, tied with Russia (37). While Turkey seen a decrease in media freedom violations between the first and second quarter (-11), Russia saw an increase (+4). Out of the Russian reports there were ten incidents of journalists being physically attacked or assaulted, one of which resulted in injury. On 13 April Dmitry Polyanin, editor-in-chief of the regional newspaper Oblastnaya Gazeta, was attacked by a group of unknown assailants near the entrance to his home Yekaterinburg. He was beaten with a metal bar and hospitalised suffering with a concussion and a broken rib. A criminal case was opened on the assault with suspicions the attack was related to his work. On 16 June Gonzalo Bonadeo, a reporter for Argentinian Canal 13, was assaulted by an Argentinian fan while covering the World Cup in Moscow. According to Bonadeo, when a group of young Argentinians fans passed him outside the Spartak stadium after the national team drew 1-1 in its opening match with Iceland, one of the fans shouted abuse at him and threw a bottle at him, which struck him on the back.